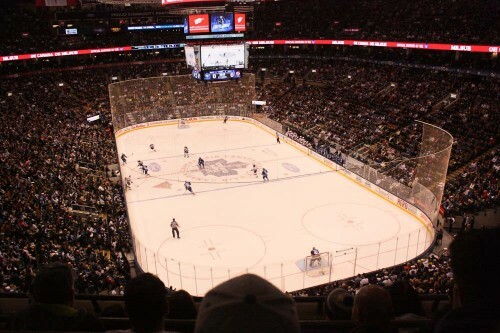 On Sunday evening I went to the Air Canada Centre to see my first ever hockey game. Massive thanks to my brother Adrian for the brilliant Christmas gift idea! Similarly to my first live baseball experience in NYC a few months ago, I barely knew a thing about the game of hockey and had never even gone as far as watching a match on TV before. I had absolutely no idea what to expect from Canada’s national winter sport. I took some notes & photos throughout the match, and I present to you here a review in my (sports illiterate) eyes of the Toronto Maple Leafs vs the New Jersey Devils on Sunday 12th January, 2014. Pretty much everything I knew about baseball up until this point, I’d learnt either from The Simpsons or from the baseball game on Wii Sports. I’d never even seen a match on TV before. 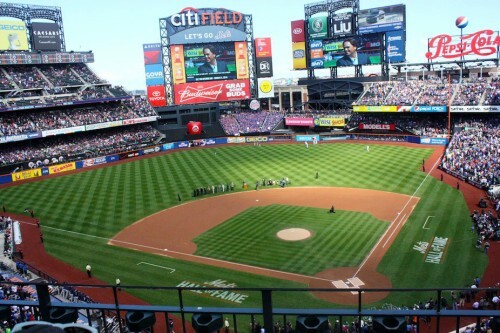 Well, I did actually play a bit of softball in year 7 but it is a different game and I can barely remember a thing about it – so I will admit to being a true baseball virgin as I made my way along the crowded #7 subway line headed to Mets – Willets Point station.